I really love video , always watch it daily. It make me feel relax , not reading entire of day! Travel videos have also become important as people plan trips. 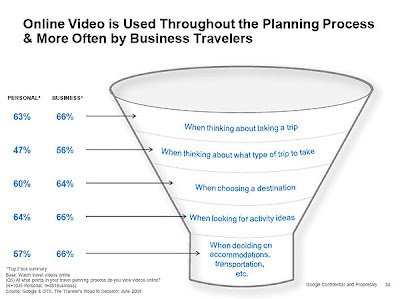 YouTube as the most popular site for videos on both business and leisure travel. Video helps people to visualize the surroundings and make better choices on where to stay and what to do. Also it created by peers are looked upon as being more trusted, compared with the videos that companies create to peddle goods and services. Online video is used through the entire planning process. When thinking about taking a trip, 63% of people turn to videos for personal travel vs. 66% for business; 47% and 56% when thinking about what type of trip to take; 60% and 64% when choosing a destination; 64% and 66% when looking for activity ideas; and 57% and 66% when deciding on accommodations and transportation, respectively. It all process that people decide where to go , what to do and where to stay. As social network and user generate content become more trustworthy source of content, people believe it! Search is key for travel planning.